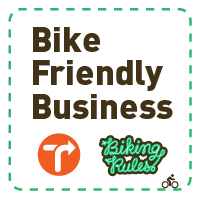 A New Street Code for NYC Cyclists | Biking Rules! Welcome to Biking Rules, your guide to cycling in New York City, brought to you by Transportation Alternatives. Biking Rules is a new 'Street Code' for NYC cyclists, following the simple principle that our responsibility to others on the street increases in relation to our potential to cause harm. With Biking Rules, NYC cyclists are taking the lead to create safer, saner streets. We need your help in making this Street Code catch on. Click here to find out more.